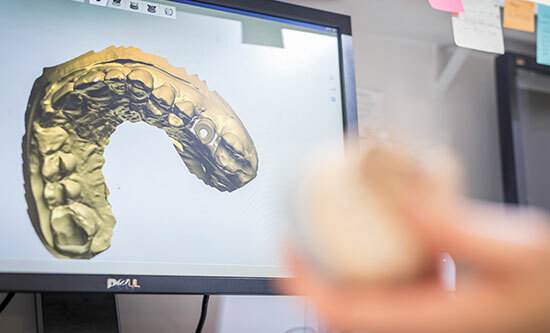 At Precision, we can receive and process scans from all major intraoral scanners and are certified as a 3Shape TRIOS® ready laboratory, as well as any systems producing digital impressions in STL open format. 8. You can now refresh your Trios scanners Lab connections to include Precision. A connection between your iTero intraoral scanner account and Precision must be established before you can send the scans to us. Please contact your scanner provider or local AlignTech/Invisalign representative and request this link. In CS Imaging, select the file & click the CS Connect button. 2. When logged in, the files will be uploaded automatically. 4. Fill out the comments or web form and select the submit (up arrow) icon. 5. The files (STL & DCM) will be transferred. DO NOT turn off the computer until the files are transferred. 6. When the lab downloads the files, status will change to ‘Consulted’. Identify PRECISION as your preferred laboratory and forward the Digital impression, within minutes we can confirm the case is accepted. We accept digital impression from any intraoral scanning system capable of producing 3D images in STL (Stereolithography) file format. Major scanner brands utilising this format are Planmeca (E4D) Planscan™, 3M™ True Definition Scan, Medit i500 and more. If you are unsure whether your scanner can produce STL files, please contact your scanner provider or manufacturer for clarification. Sending digital Impression through Dropbox. 1. Sign in to dropbox.com and click on Share a folder at the top of the window. 2. Choose I’d like to create and share a new folder, click Next, and enter a name for your shared folder.